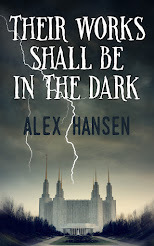 Now that Alma the Younger and the Four Sons of Mosiah have been forcibly rehabilitated, they join the good guys and decide to become missionaries. This is How Mission Calls Are Received? The sons of Mosiah volunteered because of the strength of their testimonies, not out of family pressure or cultural duty. They chose their own destination (the land of Nephi, where the Lamanites were) instead of letting some oft-touted committee of church higher-ups assign them one. They chose their own companions instead of letting a mission president assign them at his whims. Sometimes it really seems like the Church of Jesus Christ of Latter-Day Saints bears very little resemblance to the church described in its defining book of scripture. And this he did [translated the records] because of the great anxiety of his people; for they were desirous beyond measure to know concerning those people who had been destroyed. ...Now this account did cause the people of Mosiah to mourn exceedingly, yea, they were filled with sorrow; nevertheless it gave them much knowledge, in the which they did rejoice. The highly anticipated and critically acclaimed Book of Ether is the event of the summer! You'll laugh! You'll cry! You won't want to miss a single episode! Fridays at nine, eight central on ABC! Yep. The Book of Mosiah contains a backdoor pilot and a commercial for the Book of Ether. So the Urim and Thummim are What Now? And now he [Mosiah] translated them [the Jaredite records] by the means of those two stones which were fastened into the two rims of a bow. So now you know exactly what he was talking about, right? Not to overuse the why-would-they-carve-such-unnecessary-detail-into-metal-plates argument, but why would they carve such unnecessary detail into metal plates? Especially considering how useless this description is? Do we even need to know what the seer stones look like so long as we know that they were tools provided by the Lord for the interpretation of languages? What practical purpose does this verse serve other than to make every attentive reader pause, struggle to picture it, and then read on in confusion? I found this little gem in my news feed yesterday. Ugh. This wasn't posted by a Mormon, but it struck me as having a similar logical flaw to the Mormon concepts of God and Jesus. 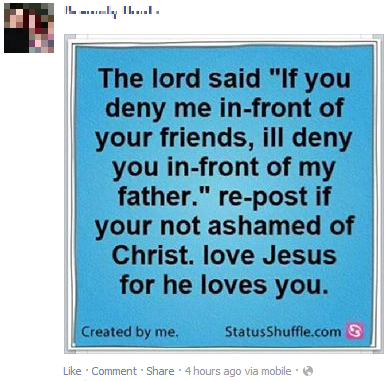 This depicts Jesus as being simultaneously vindictive and loving. It demonstrates how he supposedly holds your salvation for a ransom of love. It's ludicrous to suggest that a perfect being who lived without sin could be capable of that. It's also absurd to suggest that someone loves us unconditionally if he delivers ultimatums like this one. All that, combined with the fact that the numerous grammar and punctuation errors make the originator of this graphic look quite foolish, makes me think that this is the work of a troll. My theory is that some atheist/agnostic/anti-religious guy decided to make a little quote and hoped that lots of religious people would share the crap out of it without realizing how silly it is. It kind of makes me want to do something similar for circulation in the Mormon Facebook community. The proclamation on the family says that the family is ordained of God. Like if you believe marriage should be between one man and one woman. Share to take a stand against the wickedness of the world. I don't need to donate to charity...I pay ten percent of my income to the most charitable organization in the world. Re-post if you have a testimony of tithing! I believe homosexuality is a sin, but I don't believe that gays have any less chance of reaching the celestial kingdom so long as they don't act on their urges and marry a worthy daughter of God! Share if you hate the sin but love the sinner! The Word of Wisdom is the only health code I need...Like if you don't drink coffee, tea or alcohol, smoke or do drugs because of what it says in D&C 89! 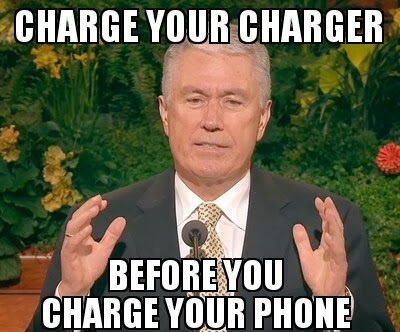 I'm sure there are almost endless ways to subtly lampoon Mormon logic. Unfortunately, as amusing as it would be to see how many Mormons unwittingly share their religion's foibles on social media sites, it wouldn't accomplish anything. I wish they could perceive the problems instead of promulgating them. In this chapter, Mosiah's people encounter more troubles with non-members. At first, the members of God's church begin to "murmur" because of "the persecutions which were inflicted on the church by the unbelievers." So King Mosiah put out some kind of official decree stating that people shouldn't persecute other religions and that everyone should be considered equal. By law, signs that said "Alma's Followers Need Not Apply" were banned. But then we meet Alma's son, also named Alma, and the four sons of Mosiah, who (wisely) do not follow in the pious footsteps of their fathers. Verse 10 states that they tried "to destroy the church, and to lead astray the people of the Lord, contrary to the commandments of God, or even the king." But the king's proclamation addressed persecution, inequality and, strangely, self-reliance. What did Alma and the sons of Mosiah do? None of that is persecution. None of it is even illegal, depending on what iniquities they got the people to commit. Did they burn down member's homes? Did they tar and feather the church leaders? Did they murder any of the members or try to drive them out of town? No. They just disagreed with the church and told people why. But, interestingly enough, Mormonism appears to have suffered from an overdeveloped sensitivity to persecution for more than two thousand years. What a horrible verse. It either implies that church leaders can get God to force a testimony into their wayward children's hearts or that enough faith can get God to force a testimony into a wayward child's heart. I hate to think of my parents reading this verse. I wonder if they think that I'm still against the church simply because they haven't had enough faith or they haven't prayed hard enough for God to change my heart. That's horrible. Joseph Smith is inflicting psychological torture on my parents from beyond the grave. If enough faith or faith from the right leaders is what it takes to summon an angel to put the fear of God back into an apostate, then why hasn't an angel appeared to Steve Benson? Or Park Romney? And now Alma and those that were with him fell again to the earth, for great was their astonishment; for with their own eyes they had beheld an angel of the Lord; and his voice was as thunder, which shook the earth; and they knew that there was nothing save the power of God that could shake the earth and cause it to tremble as though it would part asunder. Nothing, that is, beyond earthquakes and volcanoes and such. I guess you could make the argument that those things are simply a manifestation of the power of God, but that would make God kind of destructive and murderous, wouldn't it? Alma the Younger basically lapses into a coma after the angel leaves. When the sons of Mosiah explain to what happened, Alma the Elder is overjoyed, but rather than staying by his son's bedside during his recovery, he gathers a multitude to watch. Because that is what any loving father would do--prepare a massive audience so that when his seriously injured son wakes up, everyone is there to hear him say, "Dad, you were right and I was wrong." Alma wakes up with a surprising level of lucidity and eloquence. He speaks to the people about his experience and the truthfulness of the gospel, reminds them that they need to be reborn from their sinful state, and explains that if they don't repent then they're totally screwed. Honestly, this reads as less of a story of redemption than it does as a publicity stunt pulled by an old preacher desperate to revitalize his failing religion. 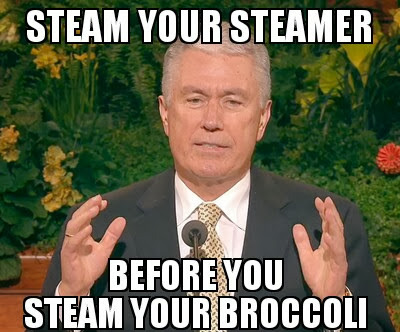 But it works--because of Alma the Younger's dramatic rebirth and subsequent teaching in the company of Mosiah's converted sons, Alma the Elder gets more butts in the pews and more senines in the coffers. When I was around twelve years old, I made a rare trip to the emergency room. At the end of a boy scout service project, a few of us had been attempting to skip stones across the creek whose banks we'd just spent a few hours protecting against erosion. One of the other boys had misjudged the right moment to release his stone, so instead of glancing off the surface of the water, it careened off the back of my skull. A few minutes later, my parents had me in the ER. As a matter of coincidence, the doctor who sewed me up happened to live a few doors down from us. I rode the school bus with his son. Although I'd never seen him before, my dad recognized him and I knew the last name. I remember feeling better when I learned that my doctor was also my neighbor. Despite the fact that I didn't actually know the man, I felt that I was in trustworthy and capable hands simply because he lived in my neighborhood and I knew his son. I was a kid. I was scared. Anything remotely familiar to me was a comfort. As it turned out, my injury wasn't that severe anyway. I think I only got three or four stitches. I don't know that I learned anything from that experience at the time, but in retrospect, I think it illustrates an important point: What brings comfort may not necessarily have any practical value. The fact that my doctor was also my neighbor had no effect on whether or not he was capable of fixing the gash on my head. If he'd been a complete stranger, he would have had the exact same chance of being a bad doctor. Similarly, a religion that makes you feel better because facing a world without it is uncomfortable has no effect on whether or not that religion is true. As I considered leaving Mormonism, staying because it was a less daunting thing to face crossed my mind many times. But just because staying in the church would be comfortable didn't mean it had any practical value. And as terrifying as it was to confront the possibilities that my life could have no inherent purpose and that I could be completely gone when I die, ignoring those possibilities in favor of the warm-fuzzy lie I'd been raised on wouldn't make them any less possible. By staying in the church, I'd be lying to myself and limiting my development as a person. But at least I wouldn't have to leave my comfort zone. Garnering the courage to leave that comfort zone and search for something that does have practical value was one of the most difficult and proudest moments of my life. Although it's pretty damn difficult not to resent being taught to trust the comforting lie. Here we encounter some trouble in paradise as the rising generation in Mosiah's kingdom fails to adhere to the religious tradition of their parents. Now king Mosiah had given Alma the authority over the church. King Mosiah. The secular leader. Has just. Given. God's. Prophet. Authority. Over. The. Church. Preposterous. I suppose Tommy Monson received his calling from George W. Bush and Barack Obama has simply opted not to replace his predecessor's appointee with his own choice? Considering how much of a fuss the LDS church likes to make about authority coming from proper, legitimate and divine sources, I find it hilarious that one of the greatest prophets of that church's primary book of scripture not only gave himself the authority to baptize but also had to be granted the authority to run the church by the king of an earthly government. Alma also doesn't seem to understand that his role is supposed to be different from Mosiah's. When Alma is confronted with the iniquities of the rebellious non-believers, he delivers them to the secular king to be judged instead of handling the obviously religious matter himself. God lays it out for him right there—Alma was blessed because he bought Abinadi's story hook, line and sinker. He was blessed because he didn't bother with outside confirmation and he didn't worry about anything other than how Abinadi's words made him feel. Because of his blind belief in unverified claims, he mouthed off to his psychotic boss, which got him fired from an extremely prestigious job and also put his life in immediate danger. He threw away his career, alienated his friends, and nearly got himself killed all because when some hobo with a white beard told him he was wrong, he trusted that hobo. And for all that idiocy, the Lord blessed him. God spends eighteen verses answering Alma's question. 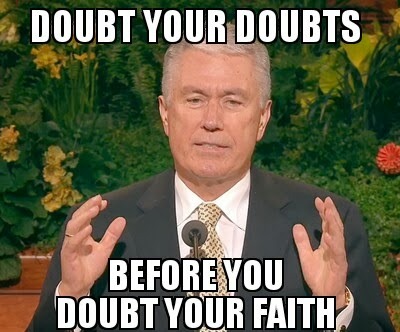 Alma's question was, "what am I supposed to do about all these sinful non-believers who occasionally deceive members of the church with their cunning words?" ALMA: Apostate, do you repent of the sins that you have committed? APOSTATE: I don't believe in your religion, so I don't think I did anything wrong, so I guess my answer is no. ALMA: Then you will be blotted out from the records of the church! ALMA: Your punishment for apostasy is excommunication! ALMA: You can't break up with us because we're breaking up with you! APOSTATE: So I can go then? How exactly is it such a harsh punishment to excommunicate someone who doesn't want to be a member of your church in the first place? And how was this answer so complicated that in verse 33 Alma had to write it down so he didn't forget? After eighteen verses of prayer-answering, it's a little underwhelming when the conclusion of God's thoughts on the subject do little else than make you slap your forehead. The more I think about it, the more I think that the concept of the Last Dispensation was one of Joseph Smith's cleverer ideas. I realize that it wasn't a complete invention, considering plenty of other Christian denominations believe that the end of times is quickly approaching. But I've rarely seen people outside of Mormondom take that belief so dearly to heart. 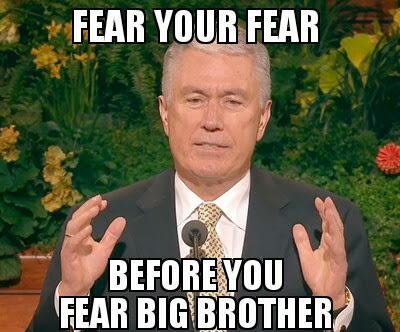 The sense of constant vigilance is pervasive in Mormonism. The belief is that the Second Coming of Christ could be at any time and that all the signs are piling up. This gives members the feeling that they're running out of time to achieve their potential. If you haven't repented of your sins and magnified your calling and done your family history by the time Jesus comes, then you've kind of missed the ultimate deadline. You don't want to be the guy that has to say, "Oops, sorry, bro, I was a little behind schedule and I'm not ready." This is why church leaders repeatedly urge us to be prepared. The real reason we're supposed to be prepared is that when you're in a continuous state of heightened panic for the fate of your immortal soul, you're not taking the time to stop and think about what it is you're doing. Rushed decisions are often bad decisions, and the more the church cracks the whip of a looming apocalypse, the more rushed the members feel. Being part of a perceived last-second full-court press makes people focus on doing instead of on what is being done--and instead of why what is being done is supposedly necessary. If you run into a building and start screaming that there's a fire and people need to evacuate, a lot of people will start evacuating. In a suddenly high-pressure situation, who's going to wait around to see if you're right? Who's going to question you about how the fire started to see if you're making it all up? The thing you're screaming about is dangerous and you're really selling it, so for their safety, people are going to take your word for it. 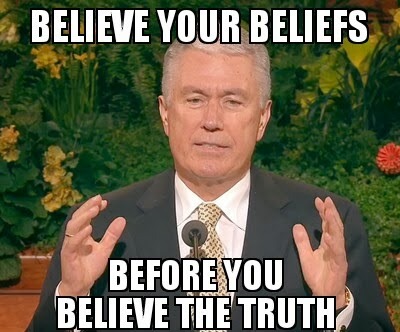 The big difference though, is that if you evacuate the building because you trusted the guy shouting fire, you've wasted an afternoon...but if you strive for Mormon perfection because you trusted the church, you've wasted an entire lifetime. As all plotlines converge on the land of Zarahemla, ruled by the righteous Nephite King Mosiah, more weirdness ensues. The entirety of Zarahemla, including Nephites, Mulekites, the people of Alma, the people of Limhi, and the disgruntled descendants of Amulon, gather to hear the stories of miraculous escapes from the evil Lamanites. And it came to pass that after Alma had taught the people many things, and had made an end of speaking to them, that king Limhi was desirous that he might be baptized; and all his people were desirous that they might be baptized also. All his people? All of them? Really? Nobody wanted to be a rebel? Nobody was sick of getting dicked around by an increasingly fickle and petulant god? Nobody said, "You know what, I'd like to think about this for a few days before I rush into a rash decision"? People don't act en masse like that, Joseph. Sure, most people may tend to follow the crowd or go with the flow, but ALL of ANY large group of people RARELY agree on ANYTHING. And it came to pass that king Mosiah granted unto Alma that he might establish churches throughout all the land of Zarahemla; and gave him power to ordain priests and teachers over every church. Whoa...why exactly does the head of state get to give the prophet of God permission to do anything? And it's more than a little strange that Alma is just going along with this considering his recent soapbox speech about how the people should "not esteem one flesh above another" and "trust no man to be a king." And what power does Mosiah have to give Alma the power to ordain priests and teachers? Alma just organized a church in his own town two chapters ago, which apparently he's allowed to do ever since he gave himself the authority to do stuff. But now, all of a sudden, he needs Mosiah to grant him the power to ordain people to the church heirarchy? Therefore they did assemble themselves together in different bodies, being called churches; every church having their priests and their teachers, and every priest preaching the word according as it was delivered to him by the mouth of Alma. What happened to personal revelation? Shouldn't the different officers and leaders of the church receive revelation from God concerning their stewardships? Why does it all come to them from Alma? That seems pretty suspicious, although I have to admit it's in keeping with the way the current church is run. Everything comes from Monson and the rest of the Big 15, because God doesn't actually talk to the Mormon church—probably because he has nothing to do with it. Which is why all big decisions in the church come from the top, instead of from personal revelation to the appropriate level of leadership like it's supposed to. God is involved. The almost-miraculous escape of Limhi's people from Lamanite rule was entirely attributed to acts of man. But in Alma's story, the people pray for deliverance and are given three miracles. God is depicted as being heavily involved and central to the story. God speaks directly to his people. Instead of plotting an escape in a very public meeting, the people of Alma are provided with their solution by God, who is probably much better at communicating in secret than that idiot Limhi. Although it seems pretty weird that so many people got to hear the voice of God despite the fact that it's been a while since even a modern prophet made such a claim, at least the story makes sense by itself. The Lamanites go into a deep sleep instead of getting smashed. Rather than offering the Lamanites extra wine and hoping that none of them had any self-control whatsoever, Alma's people have the assurance of a divine miracle. The Lamanites fall into what appeared to be a temporary God-induced mass coma, which makes it more believable that so many people can take everything they own, including animals, and walk out without getting caught. God confounded the pursuing Lamanite army. While Alma and his people are fleeing in the wilderness, God informs him that the Lamanites are coming for them. He tells Alma to get the people out of their current location and that he will "stop" them there so that they can pursue them no further. This stands in stark contrast to the absurd events of chapter 22, in which the fleeing people of Limhi, with all their children and livestock and possessions, inexplicably manage to outstrip a trailing Lamanite army by a significant margin. The other point I'd like to make is that at two different locations in this chapter, Alma's followers attribute things to the wrong people. In verse 15, when God makes their burdens feel light, it says that "they did submit cheerfully and with patience to all the will of the Lord." That's a little strange, considering that the will of the Lord was only helping them. It's more noteworthy to say that they submitted cheerfully to the will of their evil Lamanite taskmasters. You can hardly be said to "submit" to something that you're totally on board with, such as an all-powerful being doing you a solid when you're in a tight spot. The second time this occurs is in verse 20, when the freshly-escaped people camp out in a valley in the wilderness. They name the valley Alma "because he led their way in the wilderness." That's a little strange, considering that, based on recent events, you'd think it would be more appropriate to name the valley the Nephite word for "glory to God" or something. It doesn't seem very grateful of such a righteous, humbled people, to, after God sticks his neck out for them twice, name the first place they come to after the man who was simply acting as his mouthpiece. Even though it's a huge improvement over the earlier story it mirrors, this chapter still has its dumb moments. He's being raised by my firm-in-the-faith sister and her firm-in-the-faith husband. Recently, my sister and her son visited my firm-in-the-faith parents for the week. I dropped by a few times to see them during that time. My nephew likes Family Home Evenings. He likes saying the blessing on the food. He likes singing primary songs and he loves Jesus. My family thinks that all of these things are cute. Meanwhile, I silently observe, thinking that all those same things are despicable. He doesn't understand any of it. He insists on having Family Home Evening every week not because he loves the gospel, but because he likes the routine. He says the blessing on the food not because he wants to thank his Lord for the bounty he is about to receive, but because his parents say the blessing on the food--his prayers are mostly gibberish anyway. He loves to sing primary songs not because he wants to worship his Heavenly Father but because he likes to sing whether he knows and comprehends the lyrics or not. And he says that he loves Jesus because he gets such a huge outpouring of parental approval whenever he says it, not because he understands what love is or who Jesus was or why Jesus deserves our love. My sister thinks he's cute. And he is. But he's also a poster boy for a very ugly brainwashing machine that is probably going to con him into wasting two years of his life and ten percent of his money down the road. After the discussions my dad and I had about brainwashing a while back, I don't understand how he can't see it. For Family Home Evening, my dad pulled out his iPad and played "I'm Trying to Be Like Jesus" for the opening song. My nephew eagerly sang along with it, babbling incoherently through the verses and getting about half the words right on the choruses. Meanwhile, my dad sang along, trying to enunciate carefully so my nephew could understand. When my nephew became louder and more confident during the chorus, it wasn't because he believed what he was singing, it was just because he suddenly knew what he was supposed to sing. How does that not look like brainwashing? He's three. He doesn't understand. How horrible is it to force that kind of belief on someone who hasn't yet developed the ability to judge the credibility of new information? And now my sister has another son who will probably share my first nephew's fate.